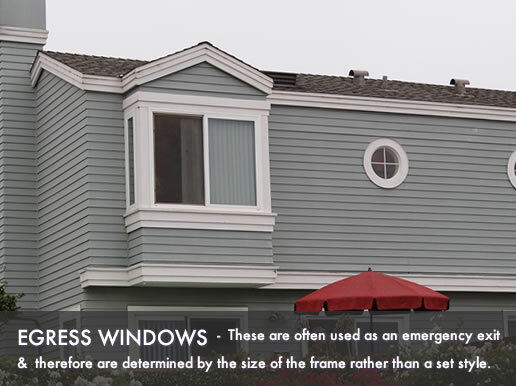 Egress windows prices vary between $1,100 and $2,600, this is an installed price. These windows are often used as an emergency exit and therefore they are determined by the size of the frame rather than a set style. The variance in price is determined on which window you are replacing, whether you are complying with building codes or whether you are just installing a basic basement window. For project pricing, try our window cost estimator. Entry level egress window project are usually slider windows due to their affordable price. While some adjustments will need to be made to ensure the sliders meet the size requirements, you get to enjoy a choice of frames, this is often composite or vinyl. You will find that you are limited in the options and colors available when choosing the entry Level option. Standard egress window projects usually incorporate standard hardware with either single hung or awning styled windows. You get a choice of frame options from vinyl or PVC to wood or low end fiberglass. When it comes to the glass options you will find that some offer beveled or stained glass, but most of the time you will be offered a low-E glass with argon fill. Higher end egress window projects are usually made from tripe or double paned high end glass with foam insulation and argon fill. The frame options available include a steel frame and in some cases a vinyl exterior with wooden interior for visual appeal. These higher end options usually come in casement or double hung window options depending on your preference. The windows themselves are priced along the same lines as any of the other window options, the price of installation increases depending on what is required to ensure your exit is code compliant. The plans need to be approved, materials and labor need to be incorporated and in some cases a retaining wall is needed which can easily push the installation price up to $2,000 for a basement egress. Entry Level egress windows prices start at $1,100 and top out at $1,500 for each installed window. Average replacement pricing for an egress project starts at $1,500 and top out at $2,500 for each installed window. Premium window costs for an egress project start at $2,500 and top out at $3,500 for each installed window.